SILVER SPRING, Md. 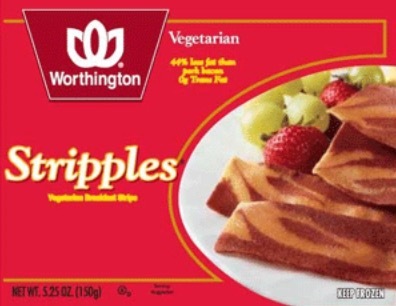 --- The General Conference of Seventh-day Adventists has banned Adventist consumption of the popular vegetarian bacon substitute, Stripples. The Worthington product was disallowed because it "gave the appearance of bacon/evil," according to a press statement issued at a GC breakfast meeting this morning. A number of formal complaints have already been filed over the ban as Adventist academy and college food service departments claim they will lose significant amounts of money due to Stripples inventory that they have purchased and can now no longer use. As news of the ban spread across the Adventist world, Hope Channel correspondent Big Frank reported "significant wailing and a grinding gnashing of the teeth in Adventist meccas across North America." "There isn't a dry eye to be seen from Berrien Springs to Silver Spring after the Stripples announcement," said Frank. "Word has it the administrators who made the announcement only did so after a blowout buffet breakfast of Stripples." Evil??? Sneevil!!!! Sniveling and knashing uncalled for! Arise and rejoice the average life span of the church will increase faster than the flight from the dreaded Hatstacks (which btw, were we created to eat – we would have been created with 4 legs and the abilities to moo in four-part harmony). Likewise, were we destined to thrive on fakin’ bakin’ with texture and taste akin to pressed wood chips and Birch bark; we would be blessed with soft fur, buckteeth, and flat tails! May have a slight appearance of bacon, but they sure have a definite taste of a cardboard box. Looks like the GC may have to banish those hot dog look alikes, that stuff that ‘s supposed to be a sausage, what about the Roma tea? Oh, I almost forgot-the Little Debbie dessert that looks like, tastes like, similar package as the Twinkies. The list goes on & on & on & on. Will the GC banish the Sabbath because you might think it is Sunday? I want my Mommie! Wake me up when this is all over!! Woe iz me!! I’ve always wondered why the Adventist church is so obsessed with being vegetarian and also so obsessed with eating Imitation Meat. Why not make those soy protein things look like, say, high protein Imitation Potatoes? – so we don’t have the problem of eating stuff that has the appearance of sin? How about high protein / low carb ice cream, enhanced with vegetable proteins and sweetened with Aspartame, Splenda, or Xylitol? Reinventing ice cream as health food . . . I’m surprised Loma Linda Foods didn’t do it long ago. That would quickly replace Haystacks as the No. 1 Advntist goody, there’d by high protein ice cream bars in every Academy cafeteria with 144,000 flavors. The Hope Channel correspondent Big Frank has an interesting name. Who are these people at GC, diet Hitlers?